The United States of America has an exceptionally long coastline, with a lot of states having at least some areas with ocean views and sandy spaces. The Pacific Coast, Gulf Coast, and Atlantic Coasts of America are filled with amazing beach locations from New England areas like Cape Cod in the northeast all the way round to Florida beaches like Miami and Clearer, across the southern shores of the country through states like Alabama and Mississippi, and then all up the western side through California and up to the Canadian border. With such a long coastline, the country has a long list of incredible beaches to enjoy, but coastal locations aren’t the only ones to benefit from beaches. Inland beaches can be found all around America too, like in the Great Lakes region, and you can find beautiful beaches even in places where you’d least expect them. For example, despite being a landlocked state without any coastal areas, New Mexico has plenty of super beaches at lakes and reservoirs. These sandy spots allow New Mexico residents to enjoy all the fun of coastal cities without being forced to drive for hours to get there. When people think of New Mexico, they don't necessarily associate the state with beaches, but the Land of Enchantment is home to some lovely sandy strips and great water sources for sunbathing, swimming, water sports, and more. There aren't many beaches in New Mexico, but the old adage of 'quality over quantity' definitely applies to this state, with NM having a few beaches of truly exceptional quality. If you’re looking for a sandy spot to have some fun in this state, read through all the useful information in our New Mexico beach guide. This is undoubtedly the most popular beach in all of New Mexico. 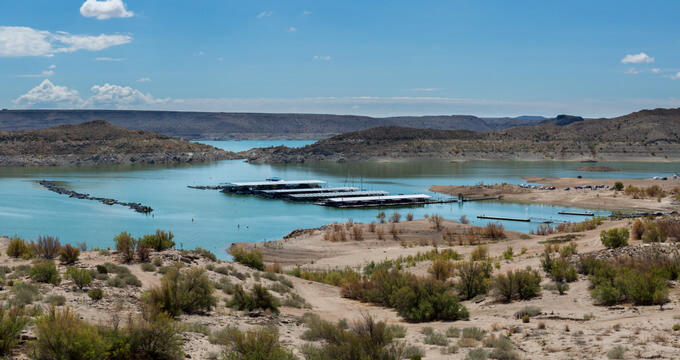 The Elephant Butte Reservoir is a beloved recreational spot for the locals, with many people driving long distances from all around the state to spend a day here. The reservoir is situated in a flat area, offering incredible views all the way out to the horizon, but also meaning there isn’t a lot of shade, so you might want to bring a tent or umbrella on sunny summer days. Visitors to the beaches at Elephant Butte Reservoir can simply sit for hours and admire the views all around them. The reservoir is also situated in New Mexico's largest state park, so there's a huge array of other activities to enjoy here like hiking, cycling, boating, fishing, and more. If you're looking for a good beach near New Mexico's capital city of Albuquerque, this is the one for you. Tingley Beach is actually within the city itself, so you won't even need to take the car to get here. There's only a small stretch of sand and this beach is hardly in the same league as some of the others on the list in terms of sunbathing and water recreation opportunities, but it's still a lovely little spot to check out if you're looking for fun things to do at the weekend in Albuquerque. The local ducks tend to claim the beach as their own, so it's a fun place to come with the kids and watch the wildlife and walk around. Fishing is popular here too and a great idea for couples is to rent a paddleboat and enjoying a romantic, relaxing afternoon out on the water. Located on the Pecos River, Lake Carlsbad is only open through to the public through the summer, but attracts big numbers of visitors during this time of year due to its beauty and wide range of activities. Kayaking and stand-up paddleboarding are both very popular things to do at this New Mexico beach, and you'll definitely find a lot of fun here, no matter who you're visiting with or how old you happen to be. There's a nice lively atmosphere at Lake Carlsbad too, and it's very conveniently situated near the center of the city and all of its amenities like shops, restaurants, and bars. Not far from Alamogordo, White Sands National Monument isn't a beach in the traditional sense as it doesn't actually feature any water. However, if you're not too interested in kayaking, fishing, or swimming and simply want to enjoy the softness of the sand and spend a long, lazy afternoon working on your tan beneath the beating sun, this is the place to be. The sands stretch out a long way in every direction, with lots of little dunes to climb and explore. Kids love it here and you can spend hours roaming around and feeling at one with nature. Located in Bottomless Lakes State Park, not far outside Roswell, Lea Lake offers another excellent New Mexico beach location. All of the typical lakeside activities can be enjoyed here, and there are some excellent nearby amenities too, so you won't need to worry about having to go anywhere or get back in the car for simple things like restrooms or getting changed. This is a really nice place to bring the whole family and find a nice spot on the sand to share a picnic together or play some beach games. There's also a protected swimming spot with calm and shallow waters, ideal for little ones.